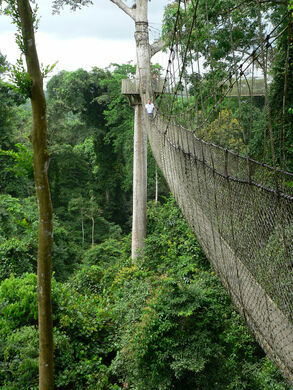 Unique on the African continent, the Kakum Canopy Walk allows hikers to experience a portion of the jungle usually reserved for climbers and fliers thanks to a trail of precariously hung suspension bridges. 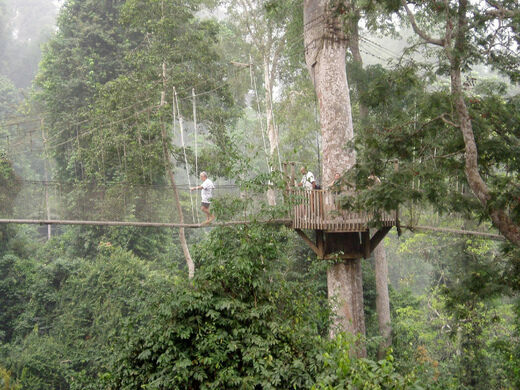 Located in the thick tropical jungle of Kakum National Park, the canopy walk was actually designed by a pair of Canadians. Looking to increase tourism (specifically ecotourism) in the largely ignored national park, the designers wanted to create a unique feature that would make the park a destination, thus an elevated trail through the canopy was devised. Opened on Earth Day in 1995, the canopy walkway consists of seven separate bridges that hang from the trees over 130 feet above the ground. 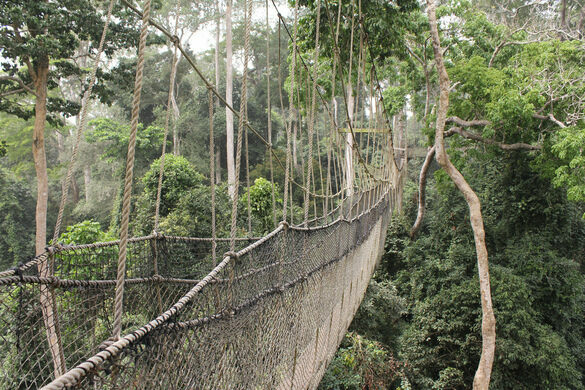 Across over 1,000 feet of walkway, the bridges look as though they are constructed like a traditional rope bridge made from the materials of the forest, however the sturdy spans are made of wire rope, aluminum, and wooden planks, and even have safety netting to keep people from plummeting off the trail. Easiest to visit by car but you can easily find a taxi for a day trip in Cape Coast. Also worth stopping for lunch at Hans Cottage Botel, where you can pet a crocodile.